In The Spotlight: Dave Tori, Do-it Yourselfer, Holicong, PA. 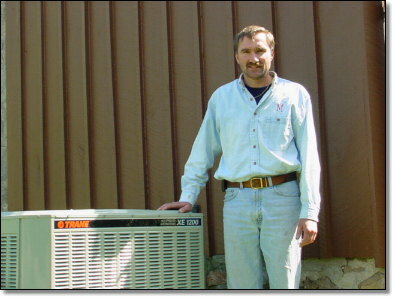 Shown: Dave Tori standing next to the Trane Air Conditioner he just installed. Dave did a great job; including the ductwork, the ceiling registers, the drain and refrigerant piping, and the installation of the equipment itself. Everything looks good and it runs great. And with a great name like Trane, Dave should have years of trouble-free performance.